The hotshots at Play’N Go company have developed a unique arcade-type gambling game. The game “Cloud Quest” is designed so the player will make a virtual tour of a world, situated on an island floating in the clouds. The journey involves encounters with courageous knights that are fearlessly slaying awful dragons using magical swords. The game features stunning graphics and impressive animation, as well as a multi-level game-play that has various rewards and bonuses. 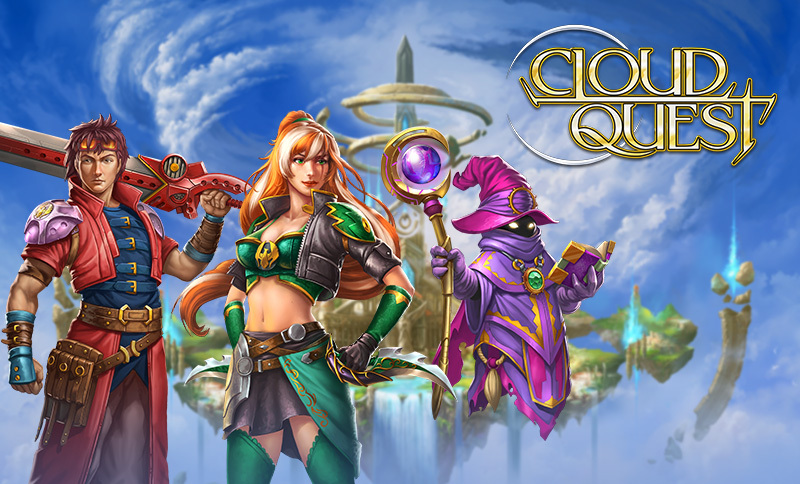 Cloud Quest can be found on several popular online casinos like LeoVegas, Mr Green and Comeon. Make sure to check out the fast payout list of online casinos on http://CasinoWithdrawal.co.uk. On the site you’ll find a lot of important information regardning depositing and withdrawing funds on online casinos. This entertaining game is purposely designed for the online casinos. The player needs to create solid chains of the same symbols. Layers can stake from as low as 10 cents to as much as 40 dollars per round. The display screen is composed of 25 elements that all appear at the same time, which are updated in each round. The icons or symbols are arranged in a 5 x 5 scheme. The main aim of the game is to create a solid chain consisting of three or more similar symbols or icons at any position on the screen display. The symbols can be arranged diagonally, horizontally or vertically, and one element can be part of several combinations at the same time. However, if the combination is entirely included in a longer chain, it will not win. The amount of payoff is computed using the bet along with the special indexes that are provided in the table. For instance, if a player plays by one dollar, the potential payoff will vary in range from as low as 10 cents to as high as 150 dollars. The icons that are included in the combination will disappear from the display immediately after the payoff has been made. 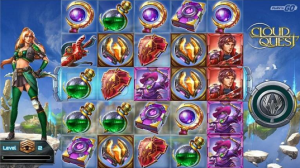 The symbols that were located above will drop to their positions, thus only 25 starting icons will be used in that round. Wild: creates its own combinations, but can also be part of other combinations to include elements that replace the missed combination. Superpower: includes 3, 4 or 5 Power Stone icons that fill 1, 2 or 3 scales on the special collection of superpowers. An honourable award: comes in the form of a high bonus pay-out that goes to the player who manages to clean all the 25 cells on the screen. BONUS: before each new spin starts, letters that form the word ‘BONUS’ appear on one horizontal lane. If the player manages to clear the entire symbols from his/her lane, the player is eligible to take part in a bonus round. A mini-slot with 3 reels and 1 line will appear and playing on it will destroy the dragons and earn pay-outs. Cloud Quest is a multi-level game. This means that as soon as the player wins against some enemies or obstacles in the bonus round, the player will proceed to the next level, while armed with new and better capabilities. The game is available in several languages, so everyone can understand all the features of the game easily.